Women’s-wear retailer Anthropologie is launching a new “inclusively sized” (women’s 16 to 26) collection today. The collection’s name is clear, simple, and elegant: APlus. Anthropologie’s last foray into fashion sub-branding was the misbegotten BHLDN, which I wrote about in 2011. I am happy to report that APlus is a vast improvement: The capital A evokes the parent brand, and the “plus” in this context is positive rather than pejorative. My favorite label for this category remains Alexander McCall Smith’s “traditionally sized,” but APlus gets a high grade from me, too. Polldaddy is dead; long live Crowdsignal, its successor in the platform-agnostic poll- and survey-creation business. The service, which is owned by Wordpress, was silent on the reason for the recent name change, leaving us to wonder: Was daddy too patriarchal? Was the name likely to be confused with the unrelated GoDaddy*, the internet-domain registrar? As long as we’re asking questions, what accounts for the plethora of DADDY brand names? There are 757 DADDY registrations in the U.S. Patent and Trademark Office database, from FROG DADDY (“men’s and women’s wearing apparel”) and CAT DADDY (“beds for household pets”) to THE SOUP DADDY (“soups, stews”), THE CANDLE DADDY (“candles”), TACO DADDY (“catering”), UNDERWEAR DADDY (“socks”), CHOCOLATE DADDY (“sunglasses”), WOLF DADDY (“reality-based television program”), and ICE DADDY (“electric air deodorizers for refrigerators”). Nearly a third of the registrations have been filed in the last two years. What accounts for the trend? The name has hit a cultural nerve with its religious overtones, creative twist and fashionable final "ah" sound. It has risen most quickly among blacks but is also popular with evangelical Christians, who have helped propel other religious names like Grace (ranked 14th) up the charts, experts say. By contrast, the name Heaven is ranked 245th. Nevaeh continued to rise in popularity over the next few years, reaching 25th (according to Social Security Administration statistics) in 2010 before falling off slightly. But there was trouble in paradise. In 2011, the Baby Name Wizard blog reported that an online survey had identified Nevaeh as “the most-hated name in America.” “Grounds for objection included look, sound and origin, the whole package,” commented blog author and name expert Laura Wattenberg. I haven’t been able to find out how long ago Fitz and Floyd (“for half a century … synonymous with excellence in design, quality and style”) introduced the Nevaeh line, which is sold exclusively on the Bed Bath & Beyond website and in BB&B stores. Two German companies. Two ads. Two strikingly—suspiciously?—similar slogans. “The Ultimate Lighting Machines.” Holtkötter. Page 161, New York Times T Magazine, March 22, 2015. In non-logo appearances, the name is spelled Holtkoetter. “The Ultimate Driving Machine.” Screen grab from the 30-second BMW “Hello Future” spot that aired during the 2015 Super Bowl. “The Ultimate Driving Machine” has been BMW’s tagline since 1975, when it was created by the American ad agency Ammurati & Puris; the company filed for trademark protection of the line in 1981. (In 1990, Rawlings Golf in Northridge, California, registered the identical slogan for use with golf clubs. That trademark was abandoned in 1992, possibly under pressure from Bayerische Motoren Werke Aktiengesellschaft.) Just before the 2010 Winter Olympic Games in Vancouver, Canada, the carmaker took a detour with a campaign called “Joy” that was supposed, according to the company’s vice president of marketing, to “warm the brand up.” BMW loyalists were not impressed, and in 2012 “The Ultimate Driving Machine” was once again in the driver’s seat. “The Ultimate Lighting Machines” has a shorter history. (BMW has been BMW since 1916; Holtkötter Leuchten GmbH was founded in West Germany in 1964.) Holtkoetter Lighting, Holtkötter’s Minnesota-based U.S. division, was denied trademark protection of the slogan in 1997, and abandoned its claim. It tried again in May 2013 under a new dba, St. Paul Lighting, and two months ago—on February 3, 2015—the mark was registered. The record is mum on whether BMW USA raised any objections during the process. Like BMW driving machines, Holtkötter/Holtkoetter lighting machines are not for bargain hunters. The slender chrome floor lamp in the ad costs almost $1,000; a starkly dramatic chandelier will set you back more than $2,000. The trademark database also shows that Holtkoetter has received trademark protection for at least one other “ultimate” slogan: “The Ultimate LED.” That product, a light bulb, is not to be confused with “The Ultimate Led Zeppelin Experience,” a tribute band. My coffeemaker broke. It was a no-name freebie, a long-ago inducement to buy Gevalia coffee. (I bought just enough coffee to get the coffeemaker, then quit the subscription program. Sorry, Gevalia.) I was reduced to consuming my emergency supply of Starbucks Via, which I’d been saving for the Big One. I needed a replacement, stat. I didn’t want a French press: I’d tried one and disliked the results (lukewarm, gritty). I didn’t want a cappuccino-espresso maker. I didn’t want one of those trendy single-serve K-cup models, which strike me as absurdly wasteful, especially if you want a little bit more than a single cup every morning. I didn’t want a 15-cup behemoth suitable for a medium-size office. I wanted something compact, efficient, effective, and not too expensive. One of my Twitter pals recommended a Braun four-cup model, but it seems to have been discontinued. Someone else recommended Technivorm, a Dutch brand I was tempted to buy on the basis of its name alone, but the smallest model costs $280, which is about four times more than I was willing to part with. I was intrigued. I’d never heard of Zutto, but I was charmed by the name. (I’ll get back to the name in a minute.) A little research revealed that the appliance’s Japanese manufacturer, Zojirushi*, was founded in 1918, which reassured me. Amazon gave the model I was considering, the EC-DAC50**, a solid four-star rating based on 124 reviews. Zojirushi also makes the much better-known Air Pot push-top beverage dispenser. And—whaddya know!—Zojirushi America Corporation is right down the road in Union City, California, in case I ever needed parts or service. I’ll cut to the happy ending: I received my Zutto coffeemaker two days after I placed the order, immediately set it up, admired its handsome looks, and made a test pot. Excellent. Even with $7.99-a-pound Trader Joe’s coffee. But you didn’t come here for a coffee review. You came here to find out why the Zutto name works so well. It's easy to forget I'm in the Bay Area—or, indeed, in North America—when I visit San Francisco's Japantown. For one thing, it's big: the largest Japantown in the United States. It also draws a lot of Japanese tourists who do things like pose for photos next to a scale model of Osaka Palace (not unlike American tourists who go to Las Vegas to see New York, New York). Then there are the shops. I spent a happily bemused hour recently in the Najiya supermarket, which was crammed with Japanese-speaking shoppers of all ages. The store is tiny by U.S. supermarket standards but well stocked with spectacular produce (including the most massive daikon I've ever seen), a near-infinite selection of tofu, and gratifyingly weird packaged goods. I gazed for several minutes at this display . . .
. . . marveling at the sheer oxymoronism of "Vermont Curry" (a hitherto unknown-to-me native delicacy). And why "Vermont" at all? Did the marketing department confuse honey with maple syrup? Because when you need Kare for your Crack, nothing smoothens like a moisturizing patch. Gatsby products occupy a large share of the shelf space devoted to men's grooming. I'm not certain what this stuff is, but I deduce that in Japan, "Gatsby" connotes glamour and hipness rather than doom and required reading. Gatsby appears to be a huge brand in Japan; I found many more Gatsby products online, such as the Mandom Gatsby Moving Rubber Wild Shake, which seems to be hair goop. What a name! Mandom! Is that a man-word for "random"? There is so much to love about this package, is there not? The imperative name. The pointy-handed conversation bubbles. The "special Foot Mat." The bug-eyed betrapped bug. And how about "Hoy Hoy"? I'm not sure what it means in Japanese*, but in English it's very close to the way Mr. Burns answers the phone—"Ahoy-hoy! "—on "The Simpsons." (It was, after all, the telephone greeting that Thomas Edison preferred.) The whole package looks like it serves double duty as a game board. I finished my tour in a gift shop in the Kinokuniya Building, where I espied a table heaped with products bearing the enigmatic features of "Bonao." Three questions: One, Who is Bonao? Two, How had I managed to miss this phenomenon? And three, Is America ready for a banana-shaped Hello Kitty? * UPDATE: In a tweet, Rochelle Kopp of Japan Intercultural Consulting explains that "HoyHoy" is the Japanese term for "roach motel." It's not in the dictionary, she adds, "but when I first learned it I was told it means 'beckon'." My parents bought their house in 1968; since my father's death two months ago, my brothers and I have been sorting through the contents--an emotional task made especially daunting by the fact that both parents were champion Keepers. We've found receipts dating back to the early 1950s, multiple photocopies of trivia quizzes from Elderhostel trips taken almost 20 years ago, and unopened packages of twin-size cotton-polyester sheets in perky floral patterns from the late 1960s. And last weekend, on an expedition into the deep recesses of the walk-in pantry, my brother Michael discovered more artifacts. I don't remember ever seeing this can or hearing of this brand. Right under the "Gumption" product name you can just barely see the line "Made in England." But someone evidently Americanized the copy on the reverse side, which includes the words stove and aluminum. In Britain they'd have been cooker and aluminium. That aside, what a great name and what a fabulous use of type! I counted seven fonts, but I may have missed one. Though it's difficult to discern, at the very top there's a cartoon mascot whose head is shaped like a scrub brush. That's "Little Gumption" himself. 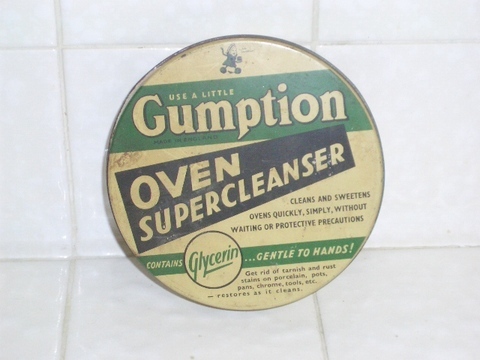 Gumption was apparently acquired by Clorox, which continues to sell it in the United Kingdom. From the looks of the spokesmodel drawing, it dates from the early 1960s. 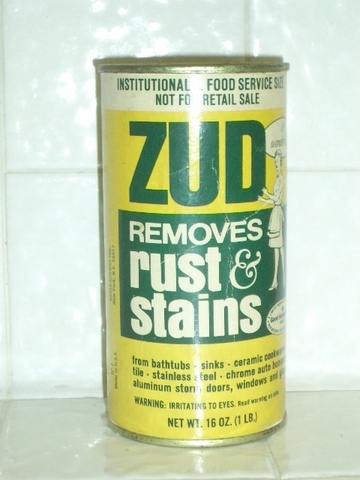 At the time, Zud was manufactured by Boyle-Midway in New York; the company was later acquired by American Home Products, which sold it in 1990 to British household-products giant Reckitt Benckiser. And whaddya know: you can still buy Zud, albeit with a snappy new logo. The product must be really good to have survived such a leaden name. 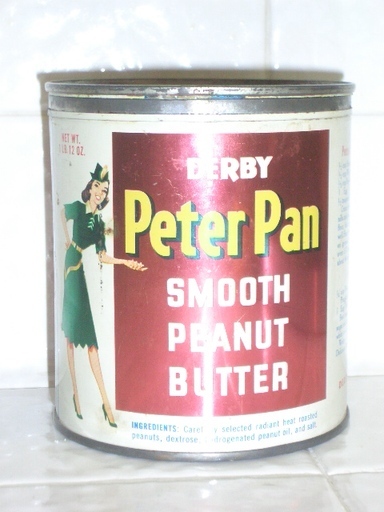 According to a Wikipedia entry, Peter Pan peanut butter was introduced in 1920 by the Derby Foods division of Swift & Company under the name "E.K. Pond." That may have sounded uncomfortably close to Pond's cold cream (introduced in 1914); for whatever reason, the peanut butter got its current name in 1928. You opened the can with the key that you detached from the base. (In a kitchen drawer, Michael and I found a small collection of peanut-butter-can keys.) The Wikipedia entry says that cans were discontinued during World War II because of metal shortages, but this design appears to date from the late 1940s or early 1950s. Wikipedia jogged my memory about a Peter Pan slogan: "Picky people pick Peter Pan peanut butter, it's the peanut butter picky people pick." The Peter Pan brand is now owned by ConAgra. It was the subject of a 2007 recall because of a salmonella outbreak. Today most farms and factories are gone. Some of the mill buildings still stand, but they are no longer used for manufacturing, The schools and Frameworks are the largest employers. Most townspeople work in bigger surrounding towns like Peterborough and Hillsboro. And most of the utensils used in American kitchens are manufactured in China. 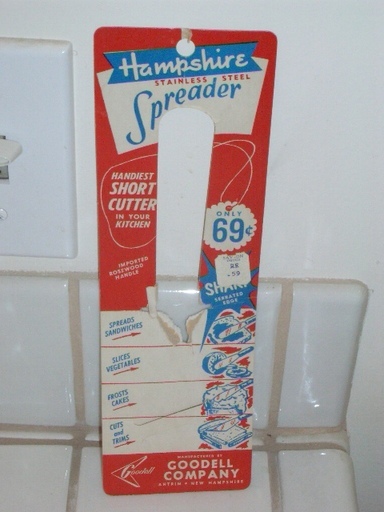 My parents didn't hang onto these products because of their nostalgic design. I'm sure they believed there was some useful life left in them. The Gumption and Zud were still part full; the Peter Pan can served as a container for paper clips and such. The cardboard spreader package? Possibly saved as a reminder of the bargain price. But I started wondering: Is there any current consumer packaging that I treasure enough to save? How about you? If you designed a radically different potato masher--the first real innovation in the category in decades--what would you name it? The folks at And Design, a London product-design firm, named their idea "Spudnik." Unlike traditional potato mashers, which have a grid-shaped or curving wire attached to a handle, the And Design product (pictured above) looks like a splayed plastic flower with a rubber-ball grip. Instead of pumping up and down, you roll the ball along your palm. The twelve plastic "fingers" efficiently transform cooked potatoes into soft and fluffy mashed potatoes. The And Design team wasn't looking to revolutionize home cooking when it came up with Spudnik. It just wanted a portfolio piece to show to potential design clients. One of those clients was the British housewares retailer Lakeland Limited, which said "no, thanks" to And Design's services but ordered 10,000 mashers. And then Lakeland renamed the gadget Simply Mash. I happen to think Spudnik is a very clever name. It's cute and fun to say, and it suggests both function (preparing spuds) and form (something from outer space). But I also think Lakeland was right to give it a more pedestrian moniker. "Spudnik" says "clever," but it doesn't say "easy"--and the chief benefit of the new potato masher is its ease. In the British market, where the product made its debut, Simply Mash is instantly understandable as a product that easily makes "mash"--the British term for mashed potatoes. And it's transparent to American consumers, who will read "Simply Mash" as an imperative. Inventors and company founders are often too close to their products to think objectively about the names and brand strategies that will succeed in the market. Sometimes it takes an outsider to bring the perspective that's needed to create a powerful, effective, and memorable brand name.